With these five heavy-duty, unbreakable dog crates you will never have to worry that your pet will escape. And they will simply love it! Make sure to read the entire post before you decide. Happy shopping. What makes a great “no escape” kennel your pets will love and that won’t make them suffer from unnecessary anxiety? It needs to be strong, durable and heavy enough to withstand any escape attempt. But, it also needs to be comfortable and spacious enough to allow your pets to remain confined for a longer period of time (for example if you are traveling). Just like with all other equipment, the market is oversaturated with various brands and models of so-called chew-proof and inescapable cages that can’t live up to the task. It can be really challenging to find one that will genuinely suit the needs of your dog, especially if you don’t know a lot about these items. Read our review guidlines for best heavy duty dog crates, and find everything that you need to know before purchasing one of them. By the time you read this article, you will know everything you need to make a decision and your pet will love you for it. Make to see our top 11 crates for 2019 overall. One of the strongest dog kennels on the market and hands down our #1 pick in this category. Impact products are well-known for their range or pet-related products. They have produced a couple of secure and robust cages over the years, and this is the newest addition – the Impact Collapsible Model. This crate has been designed to solve all those issues that usually come with purchasing one of these products. As you already know, some canines are quite determined to escape no matter the circumstances. This model easily solves the issue by having very narrow spaces between its bars, preventing the pooch from bending them apart. This also prevents the dog from reaching the latches with his paws. Another benefit is that it’s incredibly portable. At first glance, one probably wouldn’t even notice is that it can collapse and become just 8″ tall. This, in turn, makes this product a fantastic choice for all those who never have enough storage space in their cars or closets. The entire box has been crafted from aluminum, which makes it very durable and capable of successfully withstanding bumps, scrapes, and knocks. However, this sturdy material did not have a negative impact on the overall weight – the model is still lightweight enough and easy to carry in hands (especially with the built-in handle). When it comes to comfort, we have only words of praise – the model is spacious and offers plenty of ventilation. It is also IATA compliant (approved for airplane travel), has capped corners (to prevent damage to your floors), and can be purchased in several different colors. Due to its durable construction, comfy interior, and the unique collapsible design, this heavy-duty pet crate is definitely an excellent option for the price. It’s a worthy investment and one that we gladly recommend. We can safely say that the Zinger Winger line of extra strong crates is one of the most impressive on the market. As of 2019, the line consists of four top-quality models – DX5000, DX4500, DX4000, and DX3000. We’ll be taking a closer look at the best of them all – the Zinger Winger DX5000. Weighing 49 pounds and having the dimensions of 28” x 32” x 40”, the DX5000 uses aircraft-grade aluminum as its primary build material. This super strong material doesn’t have a negative effect on the crate’s portability, though – it is still lightweight enough to be easy for transporting from one place to another. The DX5000 is also the largest model in the series, and thus suitable for the owners of large canines (up to 150 pounds of weight). 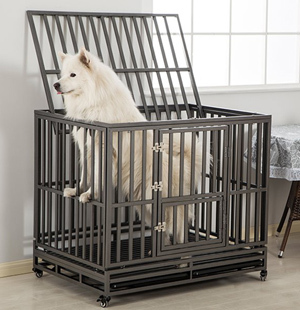 Its door features heavy-duty steel bars that are guaranteed to keep even the most aggressive dogs secure and contained. There’s a flush-mounted slam latch on the door, and it adds some extra security. Those who often travel by airplane should buy DX5000 in a kit that contains airline lines – only they make this model IATA approved. Furthermore, we were quite pleased with the amount of ventilation. There are large holes on each side of the crate, making the kennel suitable for use in high temperatures. With some padding provided by the user, the Zinger Winger DX5000 can easily become the pup’s favorite resting place. Other things we liked are Silver Hammertone powder coat on all sides of the crate, the inclusion of the grooming clippers in the package, well as the fact that the model’s door is fully reversible. When it comes to disadvantages, the Zinger Winger DX5000 comes with vague instructions and can be quite complicated to put together. For the owners of large and aggressive dogs, this model is one of better options on the market. It is secure, provides plenty of ventilation, and it’s easy to transport from one place to another – pretty impressive, wouldn’t you say? Next up is the Guardian Gear Empire, made by ProSelect – it’s one of the most robust crates on today’s market, designed to keep even the most aggressive or anxious canines safely contained. We’ve decided to take a closer look at its features and try to find out if it’s worth the money – read on! It weighs 15.2 pounds and has the dimensions of 37″ x 25.3″ x 33.8″. Unlike the plastic cages which are prone to your pup’s chewing, this thing is guaranteed to stop every escape artist from achieving his goal. 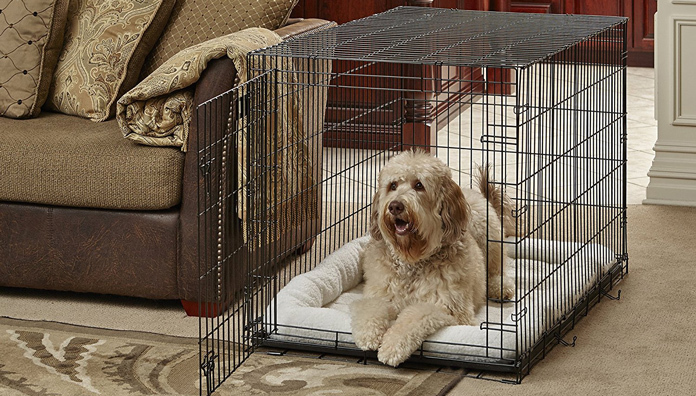 The crate is very spacious and can easily accommodate canines of all breeds and sizes – it’s one of the model’s main selling points. The construction quality of this model deserves only words of praise. Every stress point on its surface has undergone some heavy duty welding, so there’s no need to worry about breaking on bumpy roads. Furthermore, the crate’s corners are rounded off, preventing the possibility of accidental cuts. It is also rust-resistant. When it comes to safety, we were pleased to find a couple of sturdy latches on the frontal door. They sport the strength of the steel tubing, preventing the dog from unlocking them in any possible way. Cleaning-wise, the ProSelect Empire comes with a removable steel tray which makes keeping the product clean a real breeze. Even though the model is quite heavy, transporting it is a piece of cake. The thing that makes this possible is the inclusion of removable caster wheels – one only has to push or pull the object to move it from one place to another. When it comes to downsides, we didn’t like the price tag of ProSelect Empire – it is among the most expensive heavy duty steel dog cages on the market. Therefore, it’s not really suitable for the budget-minded shoppers. In our opinion, the ProSelect Empire is a perfect choice for the owners of strong, large dogs that always easily escape from conventional crates. This model is guaranteed to effortlessly handle every escape attempt of your four-legged companion. SmithBuilt is one of the most renowned manufacturers of extra strong metal dog crates – they’re well-known for the comfort and security of their models. Those looking for a reasonably priced indestructible dog crate should consider their newest product, the SmithBuilt Heavy, as it offers good construction quality, a convenient 2-door design, and a removable pan for easy cleaning. Unlike the cheaper kennels, the SmithBuilt Heavy comes with an ultra-durable and multi-layered finish which is resistant to corrosion and fading. It has a very attractive design and offers 360-degree visibility to the dog, as well as the optimal airflow. The use of premium materials in its construction makes it one of the top choices in its price category. One thing we like about this model is that it comes with two separate doors. There’s the top door, which the owner can use for feeding his pet, as well as the front door that provides the canine with easy access to the interior. The front door has two slide-bolt latches, providing your pooch with the necessary safety and security. The SmithBuilt Heavy is also equipped with a removable metal pan. It is made out of long-lasting, high-quality material that’s very easy to wash and keep clean. Furthermore, its flooring pieces won’t retain stains or odor, allowing your pet to stay healthy and clean at all times. Another thing we liked about this crate is that it comes with four rolling casters. As you can already guess, these provide maximum portability and allow the owner to move the object inside and outside the house quickly. When it comes to disadvantages, we didn’t like that the top door has only one latch, unlike the frontal one which has two. Escape artist dogs could exploit this error and successfully make their escape. Moreover, the steel used for the model’s construction isn’t really of the highest quality, but it should serve the purpose. If you’re on a tight budget but still need an escape proof kennel for your pup, definitely take SmithBuilt Heavy into consideration. It’s a reliable model with useful features that easily put it above the competition. As one of the most expensive models we’ve reviewed so far, manufactured by Grain Valley has a construction quality that justifies its price. This is an exceptional piece of pet equipment, and one that undoubtedly deserves a more in-depth look – let’s do it together! This crate is a fully collapsible model – it takes just a couple of second to collapse it to a height of mere 8 inches! When we combine this with the IATA compliant certificate and the lightweight build, we get a model that’ sports high portability and is very easy to store away. Another space-saving feature here is that the crate features stacking corners – one can easily stack multiple Grain Valley crates together. When it comes to security measures, the kennel comes with the so-called “slam” latch, turning the crate into a self-closing model. The combination of aluminum and stainless steel as the primary build materials are guaranteed to provide your pet with the necessary amount of security during the car rides. Another thing worth mentioning is that the model is rust resistant, removing the need to avoid rain and wet conditions. The ventilation, on the other hand, is solved by the addition of a generous number of holes in each side of the crate. Their purpose is to promote extra air flow and allow the owner to use the cage on warm days. The heat can also cause evaporation of toxic materials, but that’s not something you need to worry about with this model – no harmful chemicals were used during its manufacture. On the downside, this crate doesn’t come with a detachable tray. This will present an issue for the owners of dogs prone to accidents. The model is also quite expensive, but we certainly didn’t expect a low price for a crate with such a great design and construction quality. For the price that it comes at, this model certainly offers a lot – it’s one of the best products we’ve had the opportunity to test so far. As such, we can do nothing else but give it our sincere recommendation. As you already know, travel can put a lot of stress on everything – both on the living beings and inanimate objects. That is precisely the reason because of which the travel bags, suitcases, and roof racks always have such a sturdy construction – they have to withstand a lot of abuse. Keeping the dog inside is not the only purpose of a pet crate – it also protects the pooch from the dangers of the outside world. During the journey, a kennel has to withstand things like scrapes, bumps, and occasional knocks without breaking apart. Therefore, the heavy-duty models are your best choice – they’re sturdier and more durable than the regular crates. Ferries and airlines require a quality crate. When taking your pooch on a flight, for example, the operator will want to make sure that your pup’s box is stable, secure, and safe. Those who attempt to bring a flimsy device on board are risking being denied boarding. Other than that, one should never forget that events like thunderstorms and fireworks can be very frightening for dogs – some might even try to escape from the yard. In such circumstances, our canine friends tend to hide wherever they can – behind the couch, in the closet, under the bed, and at many other places. They seek areas that are small and enclosed since the cramped walls around them give them a feeling of safety and security. For that matter, purchasing an indestructible crate for a dog is the owner’s best decision. It offers your pooch a safe place that they can use whenever they want. The dog won’t see the metal bars as something that keeps him imprisoned – he will, instead, see them as an integral part of his small cave that keeps him protected from the outside dangers. In other words, he won’t see his new crate as a negative space as long as you use it appropriately. Unfortunately, our canine friends find escaping from standard crates incredibly easy. To even have a chance at keeping them inside, the owners need to understand how their four-legged friends manage to escape in the first place. There are endless variations, so we’re going to focus only on the three most common methods – chewing, manipulation of the latch, and the brute force. Most of the regular wire crates come with metal connectors – their purpose is to keep the door mounted correctly and the sides connected with each other. Unfortunately, these connectors are often very flimsy, so it’s not a problem for the dogs to mangle them with their teeth and simply escape through the opening afterward. Remember, dogs can chew through almost anything, especially softer materials. If you own an intelligent dog, he’ll probably figure out how to escape from a cage sooner or later. One possible way is by manipulating the latch mechanism. His initial attempts to do such a thing might seem random and clumsy, but after some time, he’ll learn how the whole thing works and unlock the crate’s door with remarkable speed. On the other hand, some dogs will simply use brute force to bend apart the door bars. After a bit of mouth-work, they will push their heads between the metal bars and use muscles and mass to bend them and fit their bodies through. Pups often combine these techniques to achieve freedom. Don’t expect your pooch to give up easily – he has enough energy, time, and drive to get out. Although it’s the most important one, size is actually a very simple factor. Bigger is always better, except in case you intend to use the crate while traveling. If you do; then try to purchase a model that’s only a couple of inches longer than your canine friend. Check out our in-depth crate size analysis here. There are three most common materials used – steel, aluminum, and wood. The steel ones are the most durable and an excellent option for the aggressive dogs. The aluminum kennels are a bit lighter but equally as durable, while the wooden ones look the best but aren’t as safe as the two previous versions. For smaller and not aggressive dogs check top soft-sided crates. Most models come with wheels – they are mandatory. Some models don’t, and we advise you to avoid them as moving them around is a real hassle, especially if you travel often. Crates with wheels will allow you to easily transport your pooch no matter the circumstances. For the less portable solution, you might as well go with an outdoor kennel or a good quality playpen. Another critical factor is the resistance to rust. Try to find a model that has a protective layer of special paint that gives it a necessary immunity to rust. With such a model, you won’t have to worry when the crate is exposed to elements. Make sure that your dog’s new kennel has a large door that allows easy access to the interior. The door needs to be easy to open and close, as well as to stay tight and secure once it’s closed. Models with removable trays are the easiest to clean – it’s as simple as that. Make sure to get one if you want to be done with the chore of cleaning as quickly as possible. As you can see, using an escape-proof pet crate comes with a lot of benefits, for both the pooch and his owner. This is especially pronounced if you always bring your canine friend with you when you’re traveling – a quality crate will provide the pet with safe and comfortable space in the car and other vehicles. Furthermore, using a cage for a longer period will turn this object into a significant part of everyday life of your pet. It can quickly become the dog’s soothing space, a calm retreat which he can visit whenever he wants to. He’ll use it whenever he’s afraid, stressed, or tired – it will become a haven that belongs only to him and nobody else. Dogs who are sick or have suffered a severe injury can also greatly benefit. Being able to keep your injured dog confined will undoubtedly give you the necessary peace of mind, and it will also prevent the pet from accidentally hurting himself and complicating his condition even further. Because of these and other benefits, we have decided to put the market’s most popular models on a test. We took a closer look at each model’s construction quality, level of comfort, easiness of cleaning, accessibility, level of ventilation, portability, value for the money, and other features. Our short but informative reviews should help you select a perfect heavy duty crate for your dog that will suit the needs of your pup in every way. If we had to choose a winner, however, that would undoubtedly be Impact Collapsible Model. Although it comes at a higher price, it is, simply, one of the best products of this type on today’s market. We recommend it!